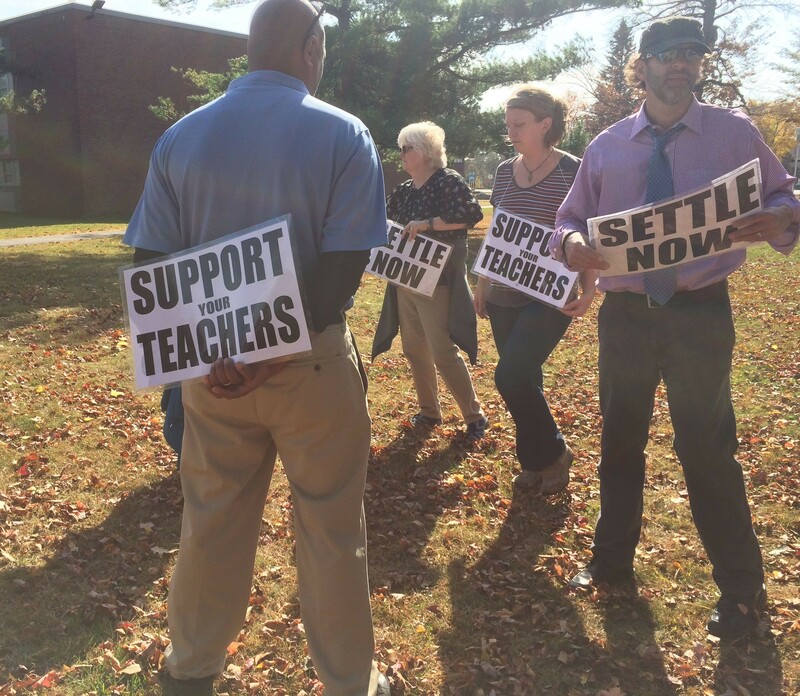 Teachers picket outside South Burlington High School Tuesday. South Burlington teachers picketed outside the district's five schools this morning as a long-feared strike — the first in the district's history — began with little hope of an immediate resolution. After months of negotiations, the school board and teachers' union failed to come to an agreement on teachers' pay and health benefits. It is not clear how much progress can be made this week. There are no bargaining sessions scheduled and the teachers say the school board must make the next move. According to union copresident Richard Wise, the board's chairwoman, Elizabeth Fitzgerald, is out of town until Thursday. The board is scheduled to meet then to discuss the negotiations. That isn't soon enough, say teachers, who sent the board a new contract proposal over the weekend. "We've suggested that in the information world, where you can Skype and there are lots of ways to connect, that there are a number of ways she can be there," said Wise, who has taught in South Burlington for 30 years. "Hopefully, we'll hear something after Thursday." The school board yesterday released a statement saying they had offered teachers "significant concessions," including a health plan more generous than ones that most taxpayers enjoy. But in order to keep their existing "premier" health care plan, teachers were asked to make some concessions to offset its increasing costs, including taking a lower pay increase, and boosting teachers' contributions to their health plan, the board said. The board said it also sought to shift some salary to less-experienced teachers, to ease the burden of the health plan for teachers who make less. "This is not the exchange, it's not single-payer, it's not speculative, and it's far more generous than many of the plans the taxpayers in our community enjoy," Fitzgerald said in a prepared statement. But teachers offered no concessions to offset the higher costs of keeping their health plan. In all, the board said, it has offered teachers $1.9 million in new compensation, while the union is seeking $2.6 million, and refusing to contribute any more to their health plan. "The 'crisis' that the [union] is claiming has been manufactured and is unnecessary," Fitzgerald said in a prepared statement. "They are willing to put the students' education and activities at risk despite the fact that the board has demonstrated significant compromise." In the past two years, South Burlington residents have seen their property taxes rise 13 percent, the board said. The offer teachers gave the board last week was the union's first counteroffer since June, the board said. The schools are already scheduled to be closed on Friday. Roughly 2,400 students and their families are waiting to hear when their normal schedules will resume. Passing motorists, including some students, honked and waved to show support for picketing teachers all morning, Wise said. More than 200 teachers were on the picket line first thing in the morning, Wise said. At the high school, their ranks had thinned to about 10 by lunchtime. Wise said the teachers would be working in shifts to maintain a visible presence outside all of the district's schools through the end of the normal school day. "People are feeling very united," Wise said. "We're prepared to go as long as we need to."